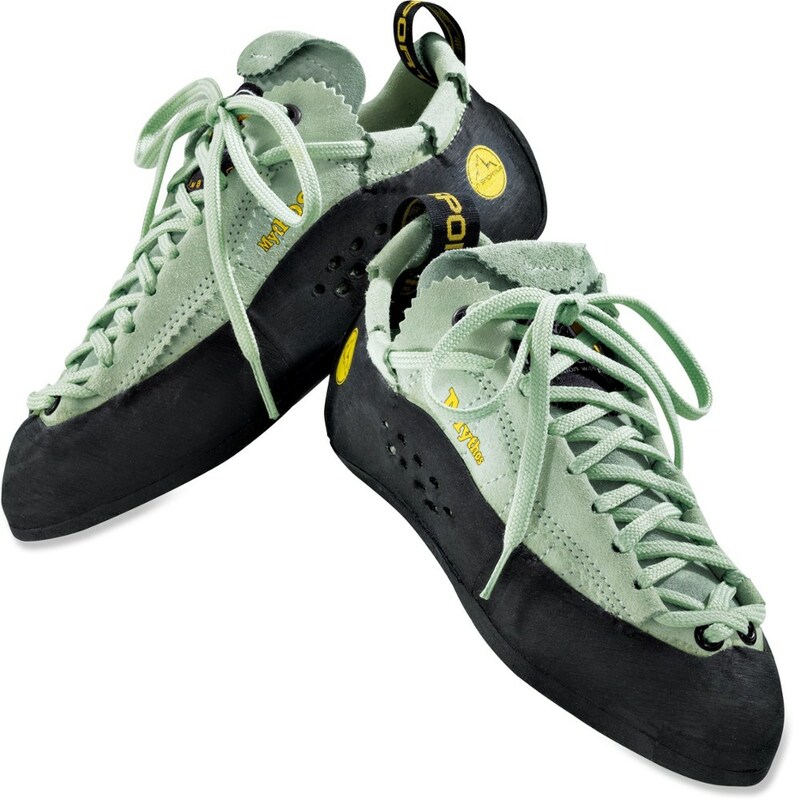 A re-edition of the iconic La Sportiva Mythos climbing shoe made with eco-friendly materials to minimize environmental impact. 25 years later, this shoe still delivers amazing versatility and performance. 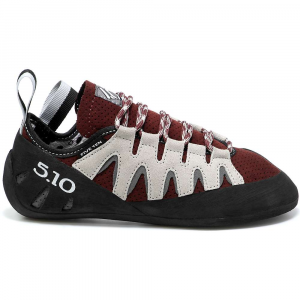 The soft unlined leather upper adapts to whatever shape your foot is and it is great for all day multi-pitch routes where your feet tend to swell. 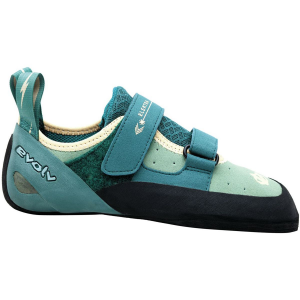 This is the perfect shoe for crack climbing with its low profile toes, flat fit, and the overall neutral round shape of the shoe. 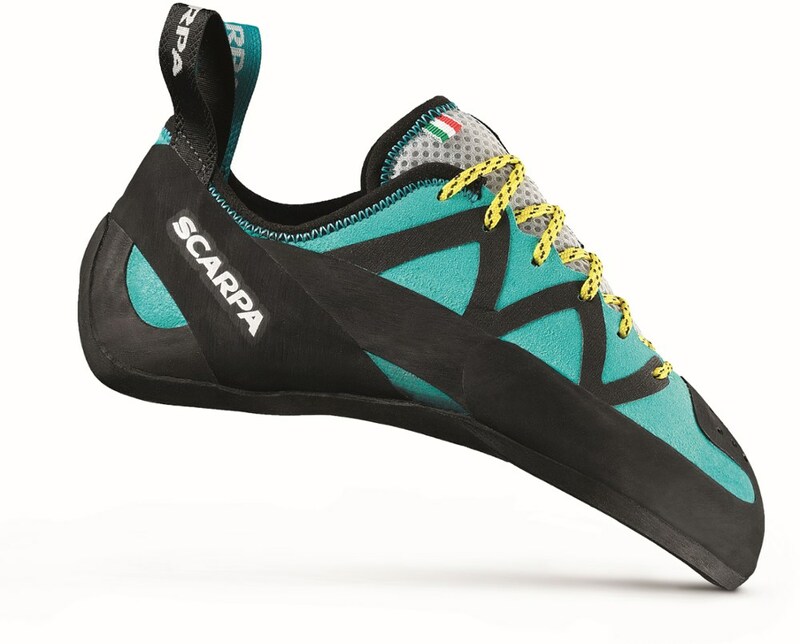 Features: - Ideal terrain: Crack climbing, face climbing and big walls - 95% of components come from recycled materials (soles, laces, webbing, tongue padding) and contribute to a reduced environmental impact (metal-free tanning, biodegradable leather, water-based adhesives) - La Sportiva ECO rubber outsole obtained by recycling rubber used during the production process at the La Sportiva factory with no sacrifice in performance - The patented Mythos lacing system allows for fine-tuned adjustments and a precise fit. 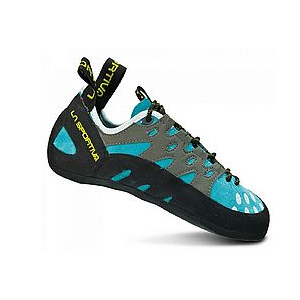 La Sportiva Climb Mythos Eco ing Shoe - Womens Green/Bay 36 20E70370336. 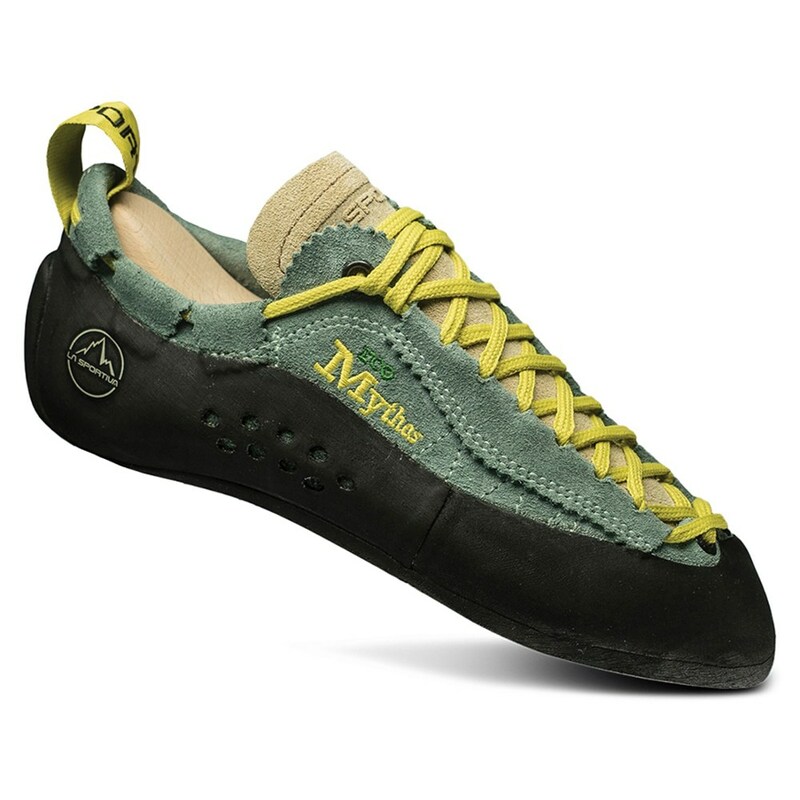 Now using recycled materials to minimize environmental impact, La Sportiva Mythos women's climbing shoes still maintain the amazing versatility and performance that the Mythos introduced 25 years ago. 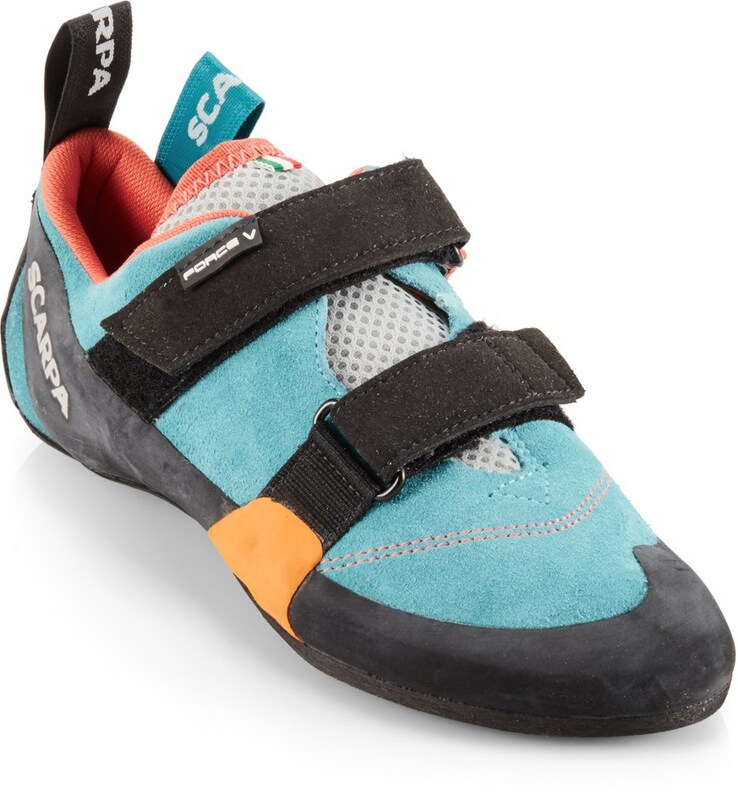 The Women's Mythos Eco Climbing Shoe is basically the same shoe that crack and multi-pitch climbers have come to love for the past generation, except La Sportiva made 95% of it out of eco-friendly materials. The biodegradable leather upper comes from Idro-Perwanger's metal-free, eco-tannery to reduce impacts on the environment, and La Sportiva's Eco rubber is 100% recycled.